Mild Hydrocracking or MHC is referring to the refining process designed to performs a partial hydrocracking only. In the mild hydrocracking only about 20-60% at ~ 50-85 bar of the feedstock crude oil is cracked. The objective of the Mild Hydrocracking process is to convert 20-60% of the vacuum gas oil at 343°C to low sulphur distillates and produce high quality cat cracker feedstocks. Refining runs through two different types of processes; hydrotreating and hydrocacking. Hydrotreaters are the most common process units in modern petroleum refineries representing nearly half of the world’s crude oil distillation capacity. A typical Western petroleum refinery uses at least three hydrotreaters – one for naphtha, one or two for light gas oil, and one or two for heavy gas oil and/or vacuum gas oil. 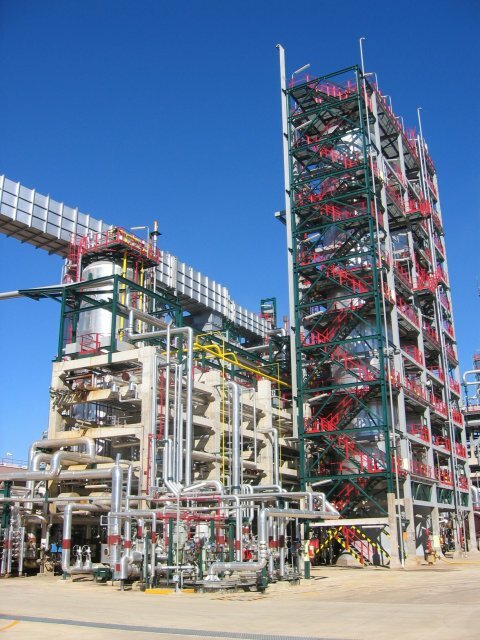 Hydrocracking is far less common than hydrotreating, but the number of partial-conversion through the so called mild hydrocracker is increasing as refiners build new units to meet clean fuel regulations. Worldwide demand for gasoline and middle distillate fuels is increasing at the expense of heavy fuels and the diesel fuel market is growing faster than that of gasoline. This situation is a problem in many regions for refiners with fuild catalytic crackers (FCC). They often have excess gasoline and heavy fuel capacity and yet must import diesel fuel to keep up with their customers’ demand at the pump. One approach would be to install a full hydrocracking unit but it is costly and its combined operation with an FCC might not yield the best answer. A more affordable solution exists. Costing but a third of a full hydrocracking unit, the Mild Hydrocracking (MHC) process goes far to solve the above problems. 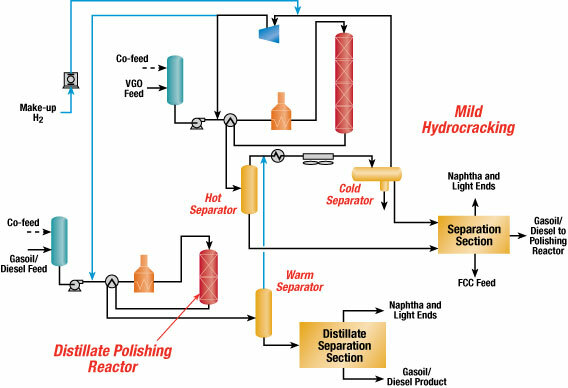 Since hydrocracking is a capital-intensive process, many refiners consider the option of converting their existing vacuum gas oil hydrotreating units into mild hydrocracking units. The use of mild hydrocracker bottom as FCC feedstock improves the quality of FCC products. For greenfield refineries as well as for the expansion or revamping existing refineries, the mild hydrocracking or MHC process is the most favorable solution for the operating companies to maximize production of high quality fuels with low sulfur content and less than 10 part per million (ppm) key products from every barrel of crude oil processed.